Cell phone laws while driving vary greatly from state to state and what is legal in one state isn’t always legal in another. 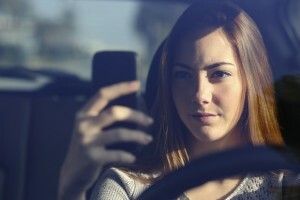 Regardless of whether it is legal or not where you live cell phone usage while driving leads to distracted driving and according to a CDC study 20% of all traffic accidents in 2010 were due to distracted driving. 69% of drivers reported to talking on their cell phone while driving and 31% reported texting or emailing while driving within a 30 day period. This is a very high number considering how risky using the cell phone while driving is. According to a study from 2009 it takes an average of fives seconds to send a text while driving, which enough time to go the distance of a football field when travelling at 55 MPH. As experienced drivers it’s easy to get in the habit of using the cell phone while driving, but remember, as a parent, your children are learning from your example. If they see you using the cell phone while driving they are going to think it is okay for them to as well. New drivers already have enough to concentrate on while driving, so make sure they don’t think the cell phone should be one of those items. If your state isn’t listed above you can find more state specific cell phone laws information at the Driving Laws website. This entry was posted in Top Driver Blog and tagged Bad Driving Habits, Car Safety, Cell Phone Laws, Driving, Road Safety, Safety Tips.